Remember that “shocking” finding at Innsbruck I wrote about last week that seemed to disprove everything anyone had ever believed about Medieval underwear? BBC History Magazine has posted a non-sensationalized article about it, complete with comments by the costume historian who is researching the finds. Well done! And well done Katy of “The Fashion Historian” for sharing it with the rest of us. Here is a link to the new article. 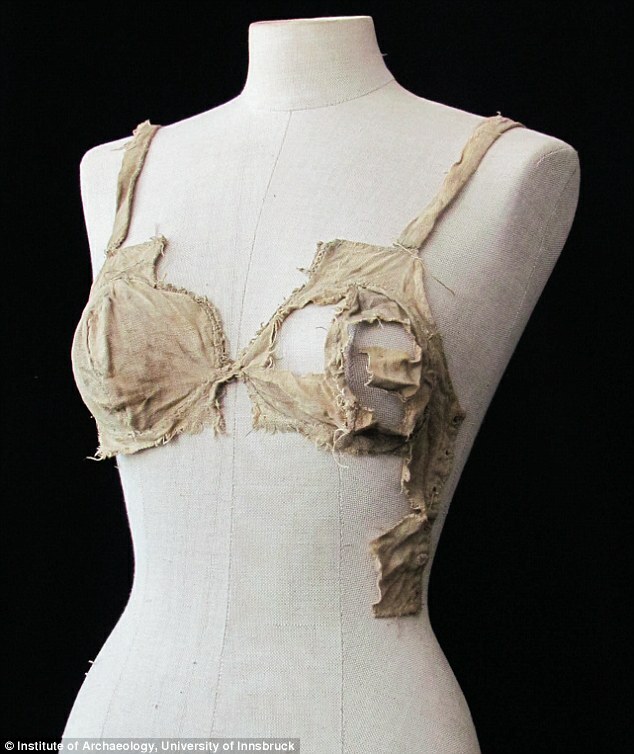 I had plans to create another post featuring the second picture that’s been going around, explaining how this “string-bikini bottom” might very well be similar to garments described by 19th-century health manuals, to be worn by menstruating women, but that is well covered by Ms. Nutz, the textile historian quoted in the above article. So I will desist. My fascinating friend, and 19th-century warrioress extraordinaire, Rachel posted a link to this article about a recent discovery by the archaeology department of the University of Innsbruck. They seem to have found evidence of hitherto unknown forms of fifteenth-century undergarments in an Austrian castle. If you’ve read any of my previous postings, you know I’m a sucker for a good historical underwear discovery. The article is a little misleading however, as it doesn’t point out that this brassiere look-a-like is actually missing a large chunk of material that would have covered the stomach from breasts to waist, and likely a back portion that laced on at the sides and anchored the other end of the shoulder straps. See the piece with lacing eyelets hanging down the left side? It probably survived because it was reinforced. Here’s my hastily drawn rendering of what it might look like with the missing material. I’m undecided about what’s going on between the breast cups at the top. Is it purposefully left open because fifteenth-century German underdresses (worn over underwear, but under the overdress) often had deep V necks? Or was there a different, finer, or even decorative fabric inserted there? The top edge looks like it was meant to end where it does, but it may also just be impossible to see in the picture that it’s also ripped and the same material once ran all the way across. Hmmmm. But, as I said, I know next to nothing about this period. So I am happy to take the word of those who do that this is a remarkable discovery. There’s another garment featured in the article, and I also have a few ideas about that. But I’ll save them for another post. In the meantime, if you run across a more scholarly treatment of this topic, please let me know. I’d be anxious to hear some of the finer points describing the findings and why they are so surprising. 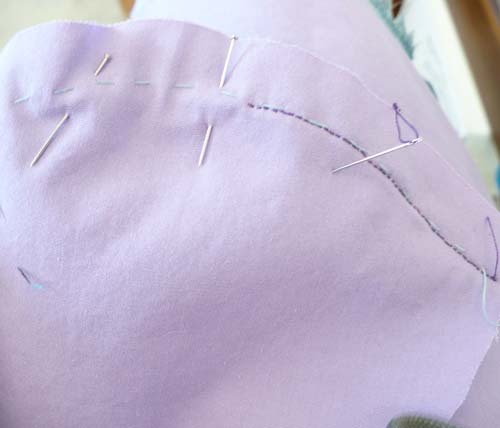 After a night of solid stitching, much of it by hand (slip-stitched faux french seams, triple-basted and back-stitched bust cups), I was finally ready for the pre-strap and closure fitting of my experimental bodiced petticoat. With the center front pinned neatly together, I stood in front of the mirror and my heart sank. By the time I’d piped and bound the bust cup seams, they were nearly as bulky as an underwire. And it was quite clear that the front closure needed boning, possibly the side seams as well. There was no way the final result would even be as comfortable as a modern brassiere. Which defeats the whole point. That’s right, a Kestos. 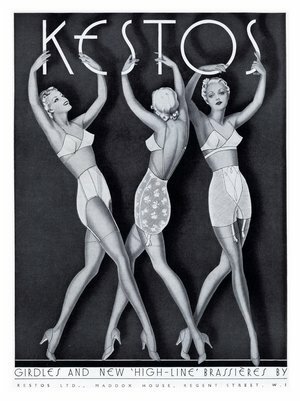 Named for Aphrodite’s own support garment, the Kestos was the most popular brassiere of the 1930s. 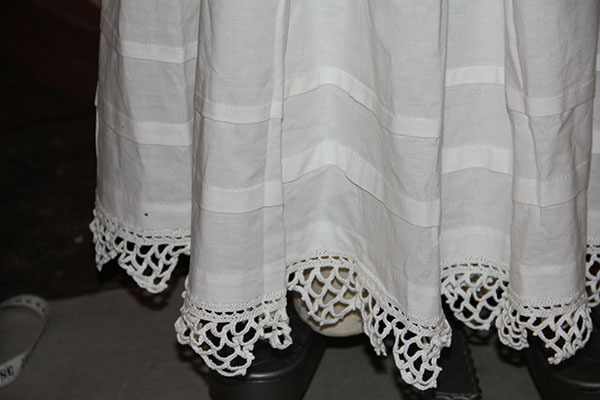 And it was originally designed with a pair of folded linen handkerchiefs connected by elastic and ribbons! What could be more comfortable? Or better suited to my free-form wardrobe? I think I may also experiment with a few chemise configurations, given my obsession with the chemise form in general. It seems like a useful undergarment for many of the looser styles I have in mind. Petticoats will just have to be separate, which is perhaps more convenient for washing anyways. I must have particularly bony knees, or kneel more than I realize; within the past six months, nearly all of my jeans have developed holes. Rather than buying another round of denim, I’ve decided to take the opportunity to make a drastic change in my wardrobe. As any aspiring fashion historian knows, it’s the undergarments that make the clothes. So I will begin by re-imagining my underwear. 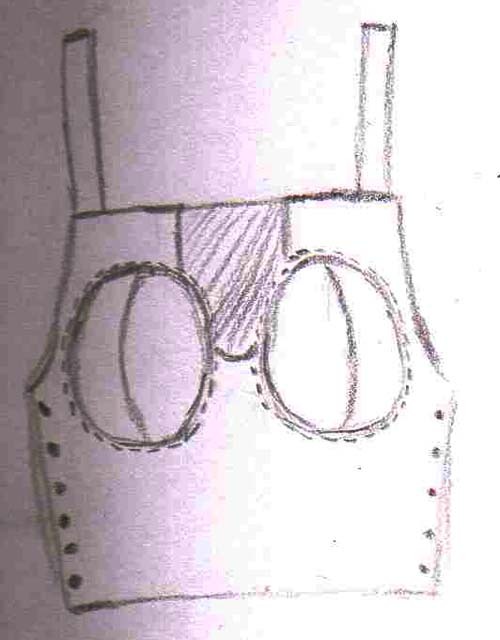 Ankle-length skirts will definitely be a staple of my new wardrobe, so I’ll need a petticoat or two to give them shape. And speaking of support, I’m even more anxious to abandon my brassieres than I am to ditch my jeans. 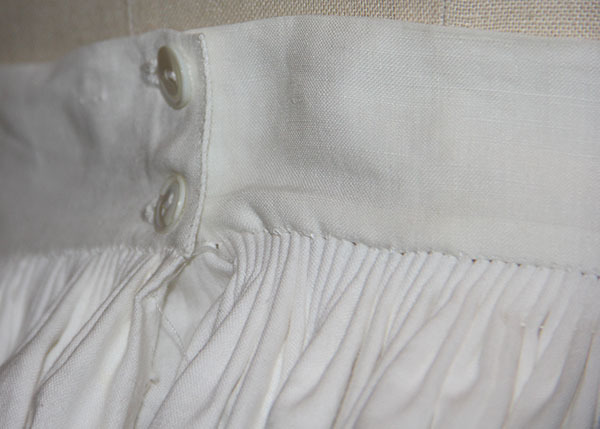 So I decided on a bodiced petticoat to offer exterior support below and interior support above. 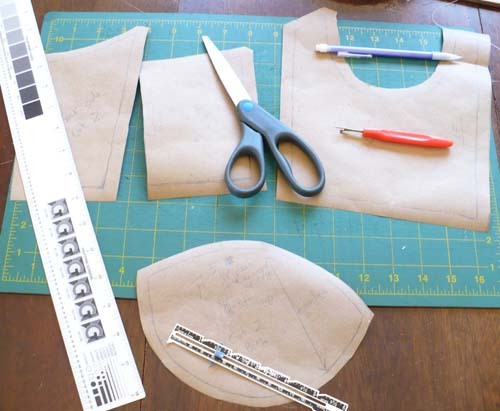 The inset bust cup is cut on the bias and lightly pleated across the top. It’s surprisingly effective. While the blush-colored cotton for my first petticoat tumbles around the dryer, I cut bias strips from an old cotton shirt. 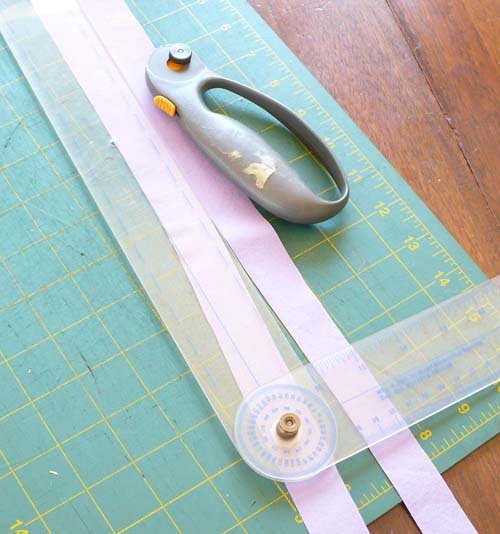 I’ll use them to bind the bodice and straps, and perhaps to pipe the seam under the bust.